Hah! I have always said that Estonian animation is ununderstandable! Incomprehensible, even. Here is a 4’47” trailer for a 72-minute 2013 stop-motion animated grand opera about the star-crossed love affair between an anthropomorphized rich-girl lemon and a poor refugee orange, directed by Mait Laas. Lisa Limone’s cruel father (a lemon with a comic-relief moustache) runs a slave-labor tomato plantation and ketchup factory. Don’t worry if you don’t speak Estonian. Nobody understands the lyrics in opera, anyway. Besides, the trailer is subtitled in English. Animation Scoop’s Jerry Beck announces two new crowdfunded animation projects, both anthropomorphic. One is Ghost of a Tale – a video game featuring a mouse warrior-bard in a medieval world, by Lionel “Seith” Gallat, a former supervising animator or animation director at DreamWorks and Illumination. Gallat’s Indiegogo site shows he has raised €28,407 toward a €45,000 goal, with 12 days to go. The other is Dogonauts – Enemy Line by Justin Rasch, a stop-motion animator on ParaNorman and lots more, mainly video games. 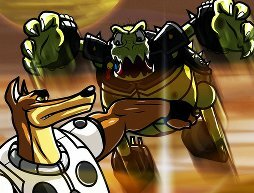 Rasch has been working on Dogonauts for four years and has finished the production, but needs money for the post-production: score, mixing, 3D post and color correction. He has a 2’21” trailer (which frankly looks like another variation on Fredric Brown’s 1944 s-f novelette Arena) with his pitch, and has raised $12,383 toward a $14,000 goal with 21 days to go. 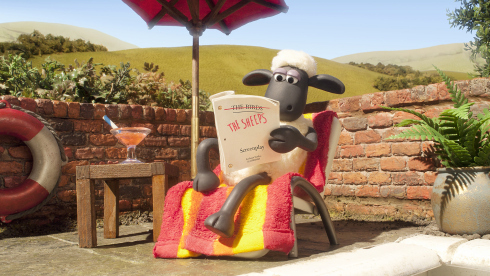 Shaun the Sheep, the ovine character created by Aardman Animations, is set to get his own movie. Shaun first appeared as a supporting character in Aardman's 1995 A Close Shave, and later got his own children's television series. Now, Aardman is to join with film-TV group Studiocanal to make Shaun's full-length claymation film. Aardman will produce the film, written and directed by Richard Starzak and Mark Burton. The plot concerns Shaun's mischief inadvertently causing his Farmer to leave Mossybottom Farm. Shaun, Blitzer the sheepdog, and the rest of the flock must go to the big city to rescue him. 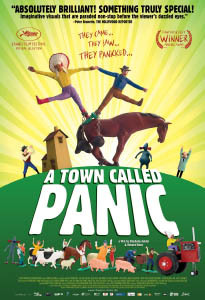 As the Franco-Belgian animated film Ernest & Celestine should soon be released on DVD, I thought this would be a good time to review A Town Called Panic (trailer), a movie produced by some of the same animators in 2009. Actually, let's go further back to 2002, when Belgian animators Vincent Patar and Stéphane Aubier created a series of twenty shorts for TV called Panique au village (Panic in the village). Each was about five minutes long, and like Robot Chicken (2005), employed stop-motion animation with plastic figurines, clay and other objects. Otherwise the two shows are pretty different. Robot Chicken enjoys mangling pop culture and doing random sketches; while Panique au village focuses on the bizarre daily adventures of a small, constant cast of characters. Something they both have in common is a joy of the absurd, and Panique is often more manic in this respect. The Cartoon Brew has posted a new animated music video, “I Have Your Heart”, about a forbidden romance between a human girl and an anthropomorphic cat-man lover. The 4’25” video is apparently not produced by an animation studio, but by three people; New York cartoonist/paper cutout artist Molly Crabapple, music composer Kim Boekbinder, and Melbourne stop-motion animator Jim Batt (and a small staff); it raised $17,280 on Kickstarter. It’s known as Posledny Autobus, which translates as The Last Bus. It was created in the Slovac Republic by Martin Snopek and Ivana Laucikova. It features human actors wearing animal heads, animated in stop motion. And here’s its description: “It’s the start of the hunting season. The animals of the forest board a small bus and flee to safety. When hunters stop the bus in the middle of the night, its passengers reveal their true natures in fear for their lives.” We don’t know what else we can tell you about this, other than to show you this little clip from Vimeo. 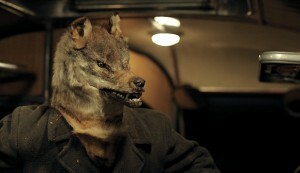 This short film has already won several film festival awards in Europe. Pixar is not the only studio that can make movies about anthropomorphic toys. The Cartoon Brew website announces that on September 7, indy distributor Hannover House will release an English-language dub of Czech director Ji?í Barta’s 2009 feature Na p?d? 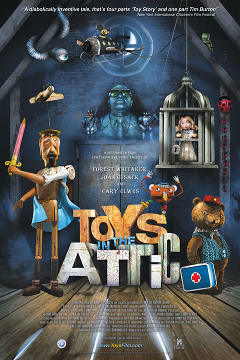 (In the Attic) in America, as Toys in the Attic. This is a mixed feature combining stop-motion puppetry, 2D cartoon animation, and live action. It’s an analogy based on the cultural and political contrasts of the Cold War era; the world of the attic is divided into the land of happy toys in the West and the Land of Evil in the East. 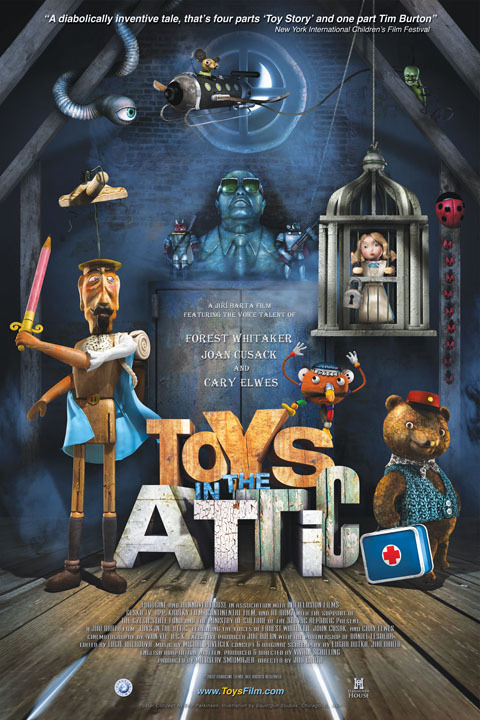 The Cartoon Brew presents the new 2012 American theatrical poster, which implies that Toys in the Attic is like Pixar’s Toy Story trilogy as made by Tim Burton, and the 2009 Czech trailer. A fish in a refrigerator sings Caruso. The stop-motion short-short – a trailer for his Annecy International Animation Film Festival award-winning Una Furtiva Lagrima – is less funny than animator Carlo Vogele (Pixar’s Brave, etc.) as he explains how he animated the dead fish. From where else but the Cartoon Brew.